I've moved to a new .Net based project where we use TFS as our build system. The project is pretty large with 150 developers and over 65 deployable applications, programs and NuGet packages. The CI, systems integration and stable branch builds results in over 200 different builds on the TFS server. I'm mostly interested in the Continuous Integration builds, 65 build,s that I'd like to monitor. I really don't want to manage 65 lights, even though that's an excuse for a new hardware project. In this case I'll treat the 65 builds as if they are a single composite build tied to a single status light. I'll do the same with each of the branch / target types so that I have 3 sets of 65 builds to monitor. The first step is to write some C# code that talks to TFS to get the status of the builds I'm interested in. Microsoft provides a .Net compatible library for communicating with TFS in the Microsoft.TeamFoundation set of libraries. This provides a simple interface that hides the web API. Our TFS server is behind a firewall tied to an Active Directory domain other than our internal domain so I must explicitly specify my credentials in the configuration file. 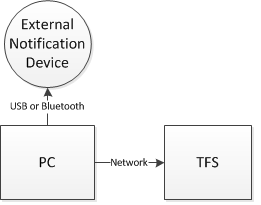 We connect to the TFS server through the TfsTeamProjectCollection class which accepts the connection URL an a set of credentials. We then use that TFS connection to get access to the BuildServer (IBuildServer) itself. A build server can have multiple teams on it each with it's own TeamProject . Each Team Project can have multiple build definitions, each with its own set of builds. In my case all my builds are on a single project in a single collection. Create a query that finds the last two builds for all Build Definitions that m match our build definition pattern. Earlier versions first found all the Build Definitions and then queried TFS for the build results for each definition separately. This resulted in a lot more queries but not much slower response time. I created a couple reusable classes to manage the data for this task. BuildWatchDriver.cs The main driver class that reads App.config properties, configures communications and acts a run loop. IBuildIndicatorDevice.cs A simple interface implemented by each of the physical device adapters. This is the interface to the build lights. TfsBuildConnection.cs This class is used to manage the network connection to TFS providing a place to store connection strings and the build server instances resulting from the authentication to the server. One instance can be shared across TfsBuildAdapter instances as long as they run single threaded. LastTwoBuildResults.cs A "bag" class that holds a build definition and the last two build results. This provides a simple way of passing around and handling related data. One instance is created for each build definition in the build set. ArduinoDualRGB.cs Driver class for an Arduino based build lamp. The firmware for the lamp is also available on GitHub. CheapLaunchpadMSP430.cs Driver class a single lamp $10 build-light based on the TI Launchpad development board a common anode RGB LED, 3 50 ohm resistors and a gift card tin case. Freemometer.cs Driver class for an analog gauge and LED output device. Another blog article discusses it's construction out of an Arduino , Ikea Dekad clock and a hobby servo. SimulatedDEvice.cs Dummy driver class that simulates a hardware device. This can be used by folks wanting to test the application who dont have any actual build light hardware. Connection information is stored in App.Config. The TFS URL includes the collection name so it is more than just http://domain/tfs. We specify full credentials to allow cross domain authentication. Build definitions are retrieved by pattern using a query-spec. We've spring wired the specification into our build adapters using Spring.Net. You should only enable as many build adapters as you have lights! The actual query is in TfsBuildAdapter.cs using the IBuildDetailSpec. The build monitor also supports a http server so that you can check the status of the builds using a web browser. This is also enabled via the App.config. You can pick any port or trailing url you want.